The human history of this planet is founded on tales of people leaving their places of origin in search of better lives; from Homo sapiens first departing their African homelands to the exploration of the Pacific over 1200 years ago, and from the Mayflower’s arrival in America and Norman McLeod’s Gazelle docking in New Zealand to those escaping Nazi Germany 80 years ago. While many such migrations have been spurred by human curiosity and the desire for resources and riches, countless others have seen masses of humanity in a rush to escape life-threatening or life-limiting circumstances, be they climatic, military or political. Such migrations have always been perilous and not without significant problems at the point of arrival. This week’s news of the deaths of over 800 people in the Mediterranean, people fleeing the dangers and untenability in countries including Syria, Libya, Somalia, Sudan and Eritrea, is not an isolated or in any way new event. What is perhaps most disturbing though is that, in spite of some hand-wringing and expressions of remorse by European leaders, it has also been accompanied by a disturbing lack of empathy (along with the deep-seated xenophobia and insularity that is ubiquitous in discussions of immigration). Political figures, now faced with horrifying proof that reducing rescue mission capabilities in the Mediterranean has not acted as a deterrent to those fleeing war, persecution and starvation, see the solution as lying in the destruction of the boats belonging to people smugglers. This proves how completely out of touch our officials and statespersons are with the reality of life for people in these countries. Such is these refugees’ desperation to escape that they will still be willing to use whatever vessel is available to them and risk the perils of the ocean crossing regardless. Unless the EU are planning to destroy every fishing boat and dinghy on the coasts of Libya, Egypt, Algeria, Tunisia, Morocco and Turkey, they will not stem the flow. 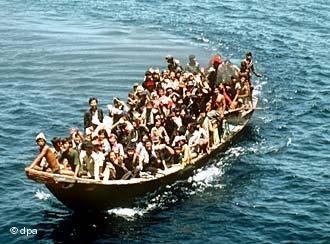 In the mid 1970s, in the aftermath of the US withdrawal from Vietnam, hundreds of thousands of people risked the perilous 500km journey across the Gulf of Thailand in a vast array of vessels of varying seaworthiness in order to escape executions, re-education camps and racial persecution. As refugee camps in Thailand, Malaysia, Indonesia, the Philippines, Singapore and Hong Kong reached their capacity, those countries began to turn boats away in 1978. Undeterred, the number of ‘boat people’ only increased. It has been estimated that between 200 000 and 400 000 Vietnamese refugees died at sea, whether from drowning, starvation or pirate attacks. In the face of this, the international community took action in 1979. 65 countries attended a UN meeting in Switzerland and agreed on an increased budget for the UNHCR to process the refugees. Many countries, including the UK, France and Germany, offered to increase their refugee quotas. The highest came from Canada and Australia, who both eventually accepted over 100 000, and the US, with over 400 000. We are a nation of refugees. Most of us can trace our presence here to the turmoil or oppression of another time and another place. Our nation has been immeasurably enriched by this continuing process. We will not turn our backs on our traditions. We must meet the commitments we have made to other nations and to those who are suffering. In doing so, we will also be renewing our commitments to our ideals. Every generation knows what the previous one should have done about its refugees. Who is not ashamed in hindsight of the world’s feeble response to the Nazi persecutions nearly half a century ago? Will our own children be any prouder of our response to Indochina’s holocaust (Newsday, June 20, 1979). It is saddening to compare such responses to those on display this week, with media commentators comparing the refugees to cockroaches and European politicians skilfully skirting questions of immigration. The recent rise of far-right and nationalist parties in Europe has undoubtedly been driven by the economic pressures people feel under as a result of the 2008 financial crisis. Immigration is a thorny issue and policy is being driven by a fear of voter backlash against anyone seen as being ‘soft’ on immigrants. As a result there has been much discussion of coming down hard on people smugglers and “assisting” in solving the problems in the troubled areas but, so far, none on the question of housing the thousands of displaced people. The US faced a similar issue last year with the increased number of child refugees from South and Central America. While Obama’s planned immigration reforms, allowing 45% of illegal immigrants to gain US citizenship, have been decried as unconstitutional, many Americans are calling for the Mexican border to be strengthened and further militarised. Where is compassion and a sense of global responsibility amongst all of this? Migration is a global phenomenon, driven by problems that are created globally, and it is only going to increase with the prospect of increasing numbers of climatic refugees looming. The world is also a fundamentally unequal place and while the wealthy nations are still happy to accept the gains provided to us, via the exploitation of resources in Africa and the Middle East and cheap labour markets in Asia and South America, we seem to have forgotten the global, moral obligations that come as part of our position of privilege and with acceptance of our responsibility for the problems in the Middle East and Africa from which so many are fleeing.